Karlyn Percil-Mercieca moved up the ranks on Bay Street as a leader in finance before hitting a wall with workplace burnout. It was a blessing in disguise that motivated her to flip her life around. Now, Karlyn focuses her time and energy on helping other women become strong leaders. 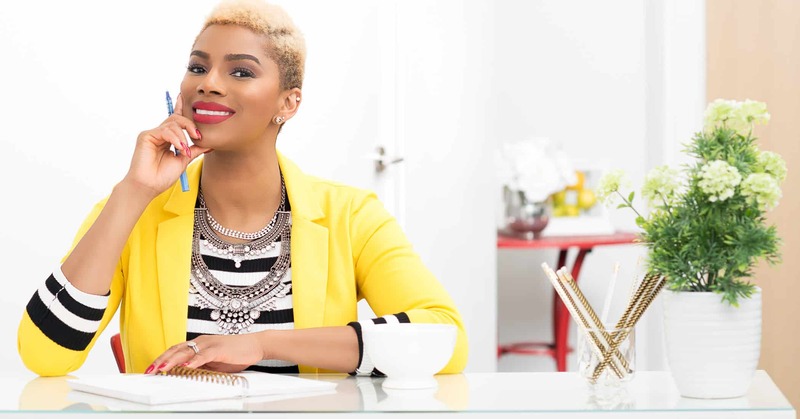 In a short time, she landed a spot on Oprah’s Lifeclass, sharing about vulnerability in the workplace. As a survivor of sexual abuse, depression and anxiety, Karlyn is committed to helping women manage their automatic negative thoughts and own their success stories so that they can better impact their world. To get started, Karlyn has developed a 2018 Success Planner for women, and we’re so about it that we’re hosting a 2018 Success Planning event with Karlyn, slated for January 18th at Make Lemonade: Toronto’s Workspace for Women. Please join us and start your new year feeling strong, in control, and ready to conquer your goals. SDTC: When planning goals for a new year ahead, what are some important questions we should ask ourselves? Who do I need to be or become to maintain focus on my goals? Are my daily actions/behaviours in line with my goals? What benefits would I experience if I accomplished Goal X? Insufficiently monitoring progress can prevent goals from being accomplished, while too much attention can limit your attention to the present moment. A balanced approach, along with the right questions, can help set you up in the frame of a growth mindset, allowing you to monitor progress towards a goal. Your Success Planner is inspired by the Oxygen Mask Theory, encouraging women to put themselves on their to-do list. When it comes to looking after yourself, what are some things in your routine that are non-negotiable? Morning routine of quiet reflection, intention setting and gratitude journalling. I do my lemon and apple cider vinegar water in silence – lighting my incense or candle and setting an intention for the day. I like doing all this in silence before letting anyone in. If my husband tries to talk to me before I have time for me, it’s a problem (LOL). This really helps me be with Karlyn before I give a piece of her to anyone else. Alone time: I colour, clean or just listen to some of my virtual mentors – anything on Neuroscience, how the brain works, positive psychology and how to increase one’s psychological capital is fun for me. I love podcasts and recently got into audio books. I’m currently obsessing over Tom Bilyeu and Abraham Hicks. Time with people who feed my soul. Quality time with my husband, nieces, nephews, brother, sisters and friends is key. I love food, so trying a new restaurant is also fun for me. When you look back on your life, can you identify a moment when things really shifted for you in terms of self-awareness when it comes to a healthier mindset? That’s the crazy thing about rock bottom: there are so many levels and layers to it. But no matter where you end up, the only place you can look is up. I got tired of being tired. I got tired of crying myself to sleep at night. I think after battling stress and burnout (which led to anxiety and depression and failing at trying to “fix” me), getting help was a pivotal moment for me. I remember calling the Employee Assistance Line at the Financial Institution I worked at and asking for help. I was assigned a stress coach and that was the moment I started taking responsibility for my life and started working towards a life I love. This was also a pivotal moment into the world of Emotional Intelligence and Neuroscience – I was fascinated by the brain and why, after doing the work, my negative thoughts still persisted. Being obsessed with a healthier mindset truly changed my life. For women who feel there are many elements in their life that are lacking or disorganized or unhealthy, what’s your advice for first steps? FIRST: Identify the areas in your life you are organized in and leverage what works well in that area for the areas that needs improvement. SECOND: Make a list of all the things you would like to organize and start with the one that requires the least effort. The key is to take one small step today (research tells us that you just need to start with one step). Taking the smallest one will help you get to the finish line. If you start with the biggest, things get overwhelming and you might just give up on Day 1. What personal discovery did you make in 2017 that is guiding your intentions or goals for 2018? My biggest aha moment is discovering the power of the pause. I came from a high stress, high “doing” role on Bay Street. I juggled many projects where everything was due yesterday. This year, learning to trust silence, pausing, taking a three-week break from social media – it all freaked me out but also gave me my biggest lesson: There is movement in silence and when we operate from that place, alignment happens and leads to greater results in all areas of my life. 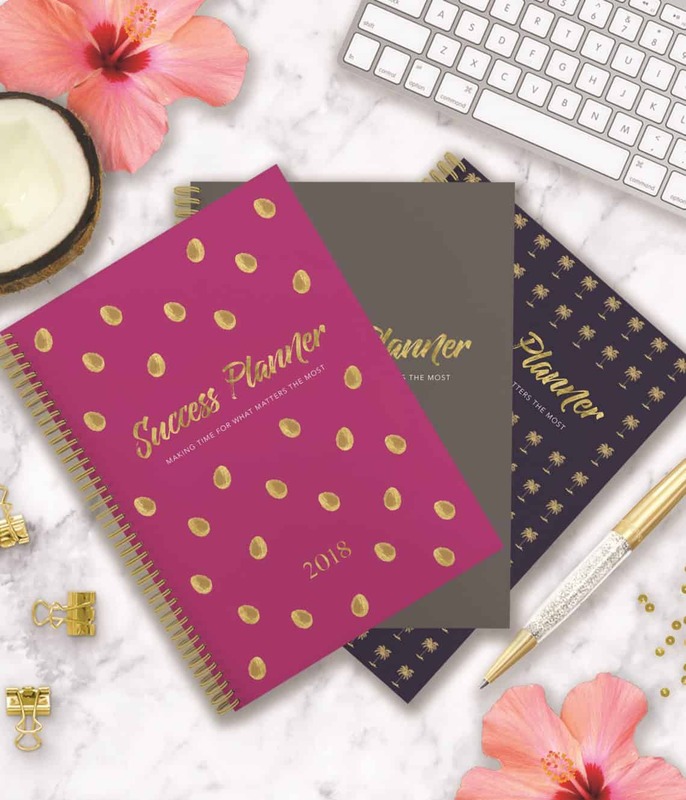 How have you designed the 2018 Success Planner to help benefit women? I researched the Imposter Syndrome Complex and looked at other research from leaders like Arianna Huffington, Dr. Brene Brown, Oprah and more, looking specifically at the challenges women face – including my own journey. This year we added Self-Care activities because women are notorious for putting themselves last. I looked at the science of human behaviour and the science of well-being and happiness – what do we need to do to create moments of happiness and to truly flourish in life? What will it take to transform and sustain that behaviour? I deconstructed the “HOW” and made it easy to include into the busy women’s schedule. For example, according to Imposter Syndrome and Cultural Conditioning, so many women lack confidence and belief in their talent, resulting in many women attributing their success to luck. Women are afraid to negotiate and many wait until they have 80–90% of the job requirement before applying for a role. Research shows that tracking what we do well (e.g., writing down our accomplishments) increases our confidence and belief in ourselves. Women can track their Bright Spot every month and how many times they submitted a BOLD Ask (e.g., asking for that new job, a raise). We also included a Networking Tracker so that women can ensure they are out there meeting people. These are just a few of the key metrics in the Success Planner designed to help women focus on what matters. The science of human behaviour isn’t gender-based, so men can also get results; my focus was women because I saw how much I struggled and how much my friends struggled. What current philosophy or guiding principle is playing a major role in your life journey? There is power in pausing; there is movement in silence and to surrender to what is. Most importantly, I am worthy of my dreams and my desires.